Brooklyn, New York DIY duo give punk/new wave a little less polish on its much-anticipated second LP. Grand is Matt & Kim’s loudest album. This acknowledgement, made knowing full well it happens to be only the band's second proper LP, also comes knowing a louder album could not be made by this twosome. Call it the band's lackadaisical stab at lingering brightness. At any rate, it works, perhaps, even better than the band had hoped, as its punked-up pop variations get married to sonic assaults on the wailing-wall of sound then get placed in the foreground throughout this dynamic duo's aptly titled sophomore venture. Grand presents a perfect sampling of Matt & Kim’s own perfectly acceptable redundancy factor, while building upon a more intriguing promise of noise-laden pop stardom. Matt & Kim create deconstructed pop that retains all of the elements of truly successful bubble-gum without the manufactured resonance. They do not linger; they do not mill around; and with a second LP barely reaching 30 minutes, they don’t seem too eager to completely abandon a winning formula. As per usual, Grand finds Matt using propulsive synth melodies and an almost robotic timbre to create a distinct neo new-wave atmosphere, while Kim’s rhythm sputters and bounces with the pop-punk gusto of a middle-school sk8r. A duo that could easily work as the antithesis to Jack and Meg (if anyone actually cared to make such a reference at this point), Matt & Kim, on Grand, allow the obligatory shades of introspective maturity to loom lightly in the shadows, adding a richness to its typical repertoire -- which, by and large, remains in tact. Despite the move from Iheartcomix to the start-up Fader label, Grand, as evidenced early on, embraces the same DIY aesthetic that have kept Matt & Kim so charming over the last several years. So, really, what proves most compelling is how the more things change, the more they stay the same. With such a similar production method to its debut -- and really such a simple formula implemented since the pair’s creation -- the fact Grand has a personality of its own classifies as a triumph in and of itself. Beyond that, though, the album finds ways to break down Matt & Kim’s already bare-bones method, while still remarkably retaining such kinetic energy. Recorded at Matt’s parents house in Vermont, Grand immediately sets a loose tone for itself with album opener and lead single “Daylight.” Its mechanical, mid-tempo percussion accompanied with a lightly ascending keyboard loop makes for a curiously disarming opener. It leads into the recognizable “Cutdown”, which brings back the band's trademark bouncing pop. However, after immediately reverting to familiar ground so early on, an atmospheric shift gets introduced that hangs over everything else on the album. Tracks like “Good Ol’ Fashion Nightmare”, “Turn This Boat Around” and “I Wanna” prove to be competent milemarkers, while instilling a welcome, slightly raw quality. It’s intimate and personal without fully compromising any of the bratty consistencies; it's still post-new wave, though with an aural easiness to its largeness that feels less forced. It feels like home -- in a different neighborhood. Grand runs into something of an identity crisis in its third act, as it moves through these phases a bit too quickly and gets left sitting and twirling in a way. Fortunately, most of its flubs (only a precious few) do not stand out. 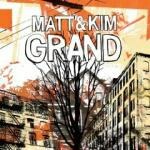 Essentially, Grand proves to be the best kind of follow-up album for a blog-hype band like Matt & Kim: It showcases the batshit-crazy charm and energy that brought them to the table to begin with, incorporates a more refined version of themselves and delivers it with a marginally impressive amount of skill. It’s a loud little album made by a couple of adorable little loudmouths. What’s not to like?